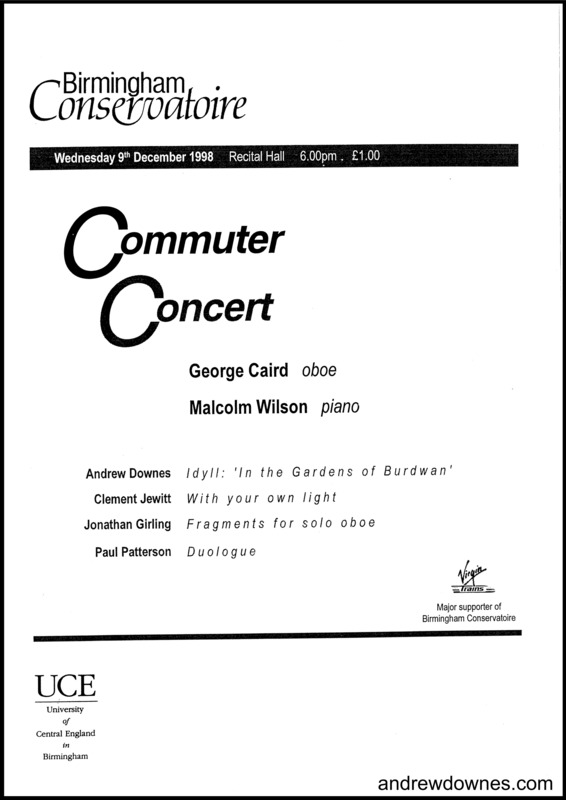 Not long after taking up his post as Head of Birmingham Conservatoire, George Caird asked Andrew for a work for solo oboe and piano. 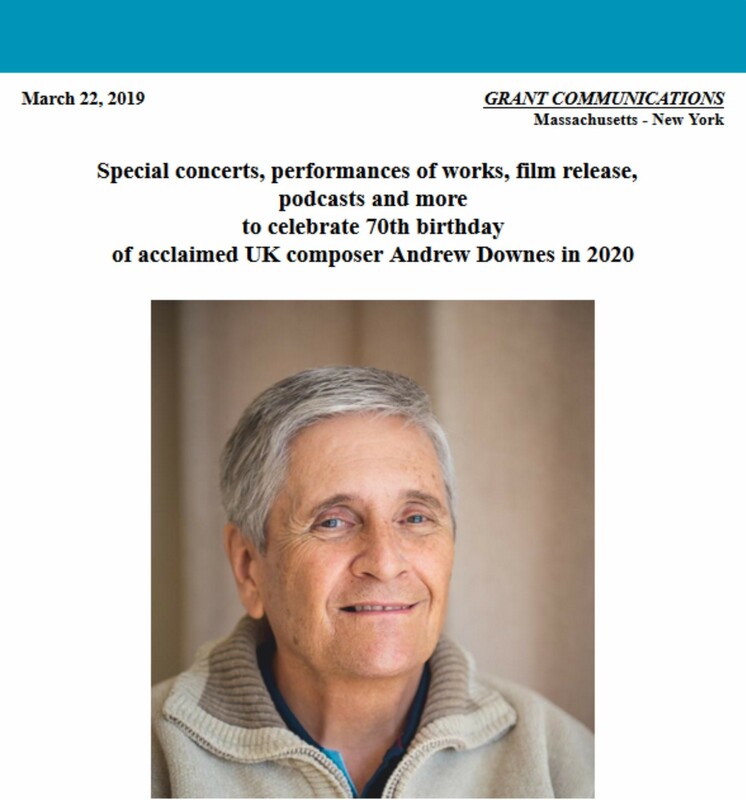 Andrew had just returned from an amazing trip to India for a performance by John and Gillian Mayer of his Sonata for Violin & Piano, and for meetings to set up an exchange programme with the University of Burdwan. 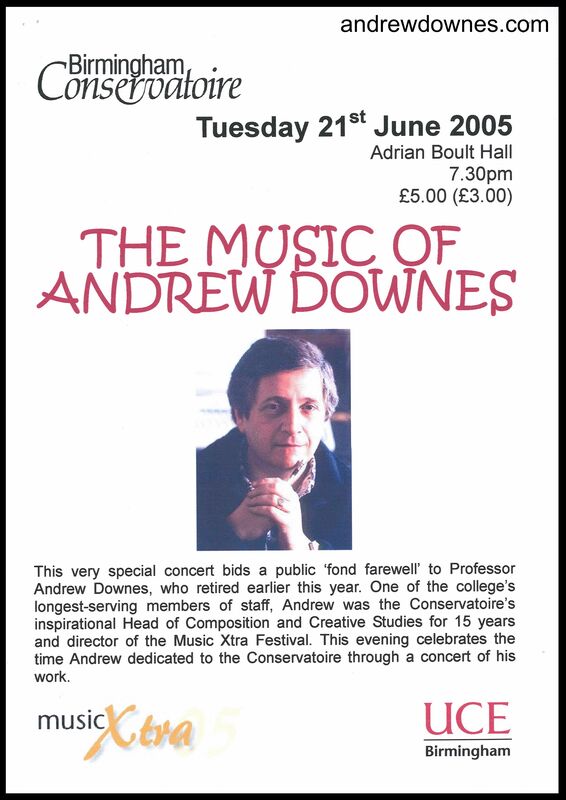 The gardens of the University were so beautiful, that they inspired Andrew's composition for oboe, so much so that he gave his work the title: In the Gardens of Burdwan: Sonata for Oboe and Piano. The 4 movements of the Sonata reflect all the gorgeous sights and sounds of these gardens, which are still in Andrew's memory to this day. 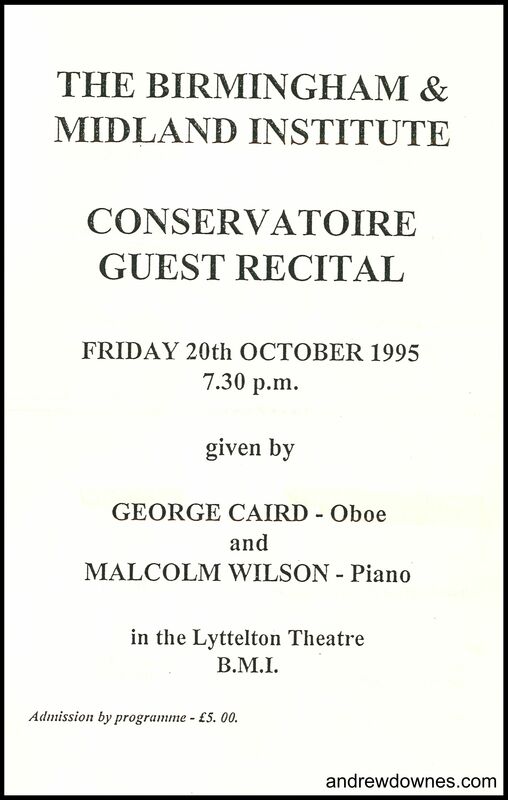 George Caird, with Malcolm Wilson, premiered the Sonata in the Birmingham and Midland Institute on 20th October 1995. 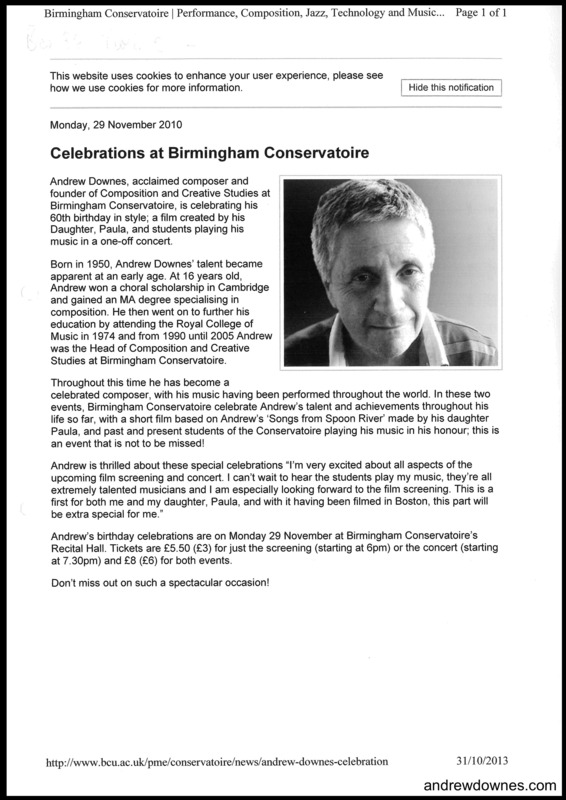 Read Andrew's talk in Birmingham Library preceding this concert. 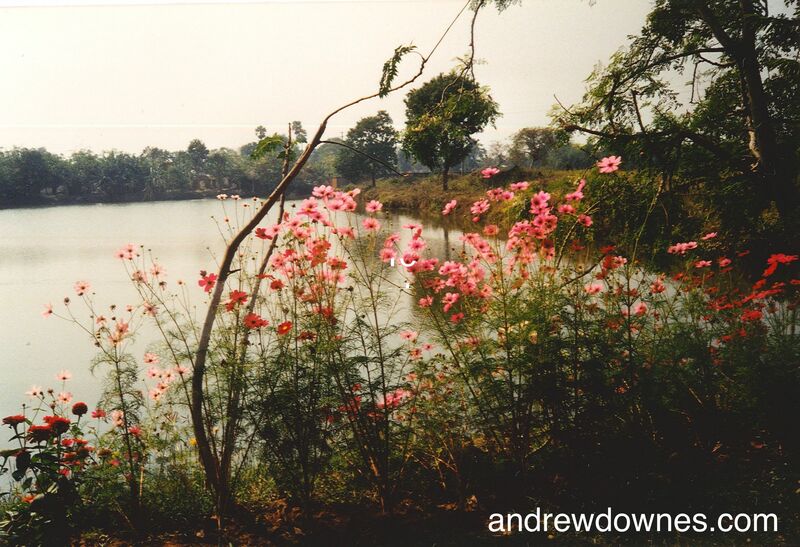 In 1999 George and Malcolm recorded ln the Gardens of Burdwan on their CD entitled 20th Century Music for Oboe and Piano. Their CD has been broadcast on Radio here and in the USA. 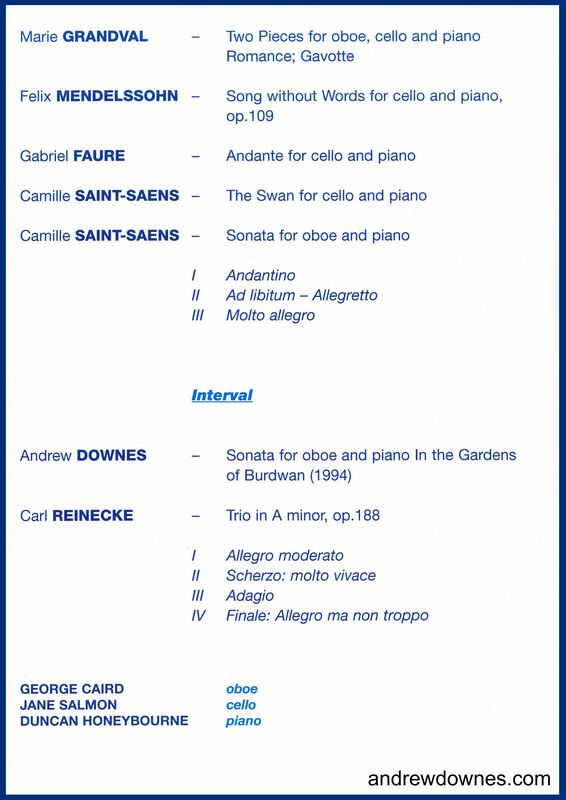 Here is a snippet (the last few bars of the Sonata) to illustrate the beautiful atmosphere of these Gardens. 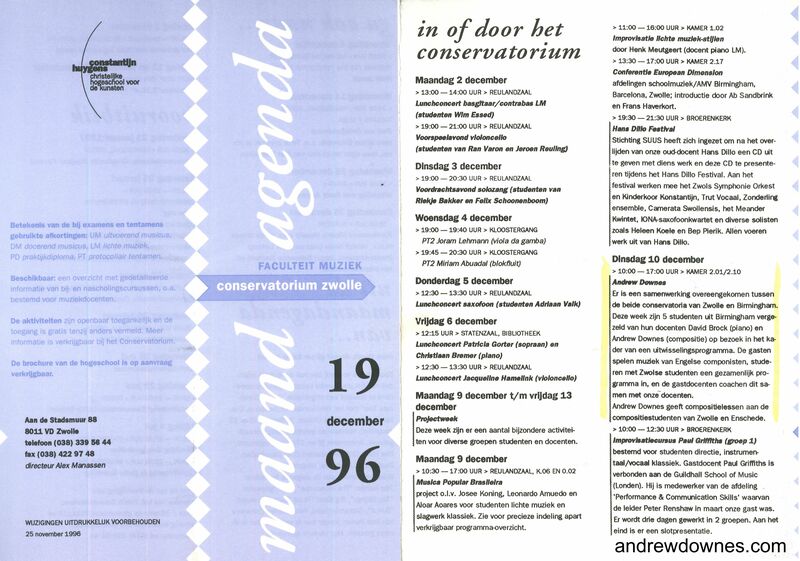 Hazel Wright with David Brock gave the Netherlands premiere of this work on 11th December 1995 at the Zwolle Conservatoire of Music. 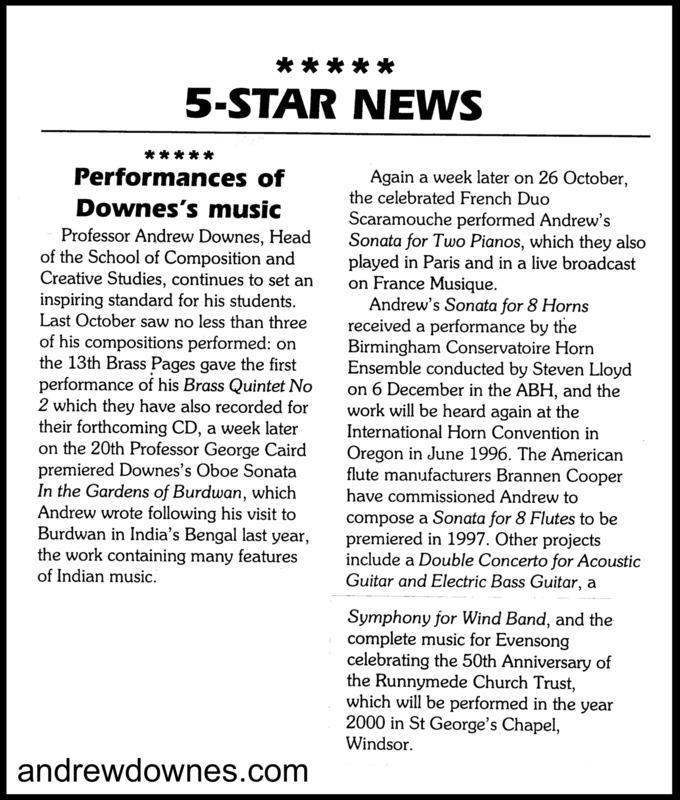 This performance was particularly memorable, because someone forgot to put the piano brakes on, and the piano, together with the pianist and page turner (Andrew), slowly edged across the stage throughout! 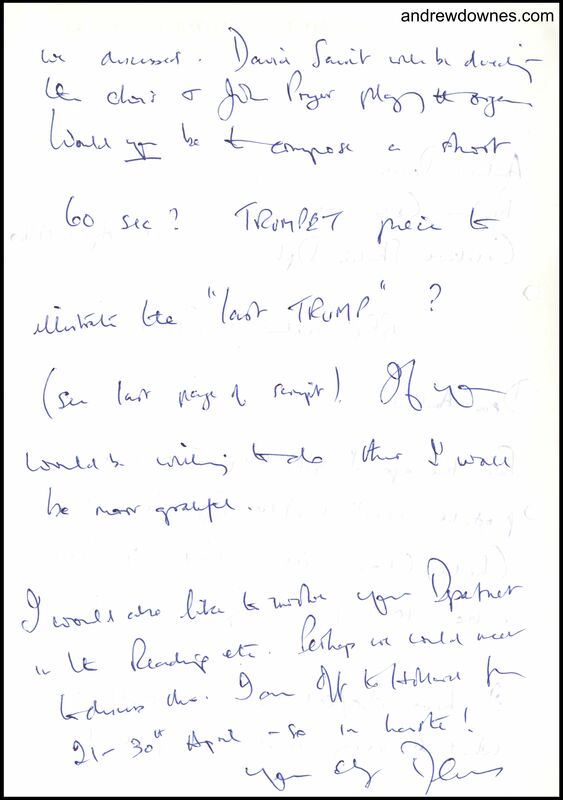 David Brock (who sadly passed away in 2015) was always extremely funny. 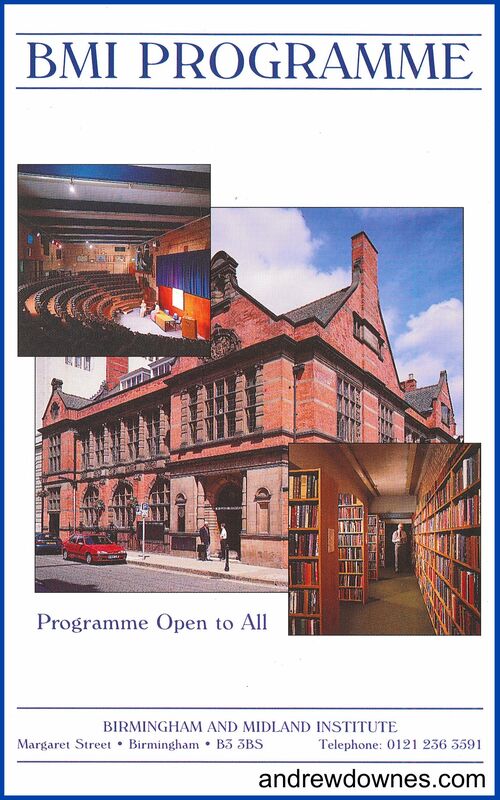 Just before they left for Zwolle, Hazel and David gave a pre tour performance of the Sonata for Oboe and Piano in the Recital Hall of Birmingham Conservatoire. As he came off the stage, David said, "I almost got some of the notes!" 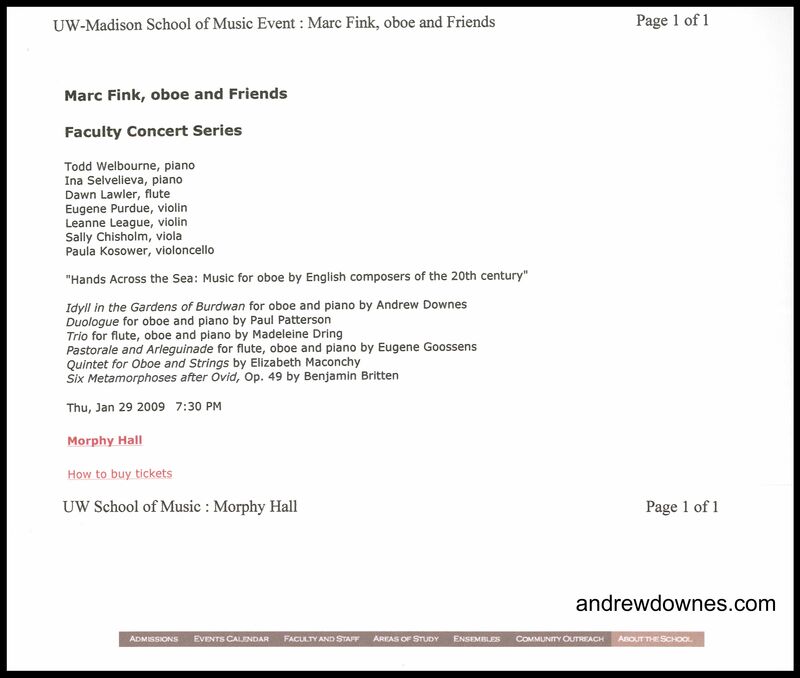 I have sold many copies of this work, particularly in the USA, where the first American performance was given by Marc Fink with his accompanist Todd Wellbourne in Wisconsin on January 29th 2009. 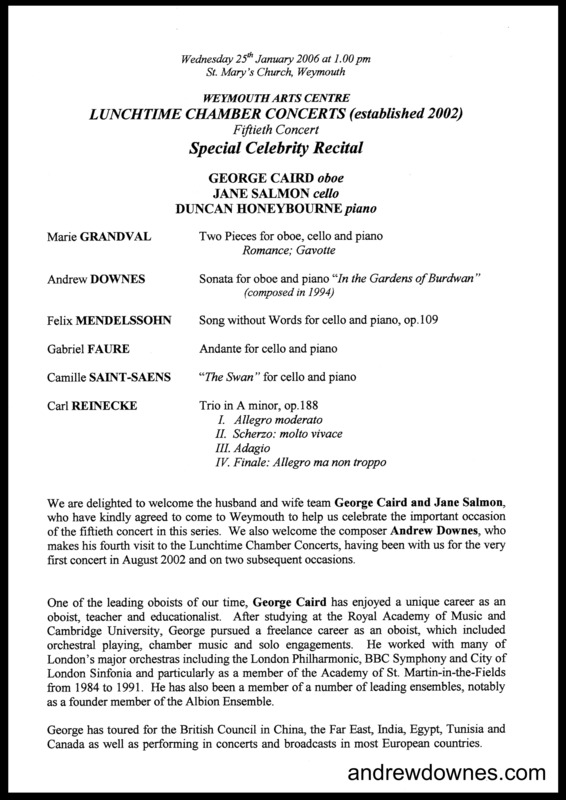 At Andrew's Retirement Concert, in the Adrian Boult Hall, Birmingham, George Caird and Duncan Honeybourne gave a spellbinding performance of the Sonata, in June 2005. 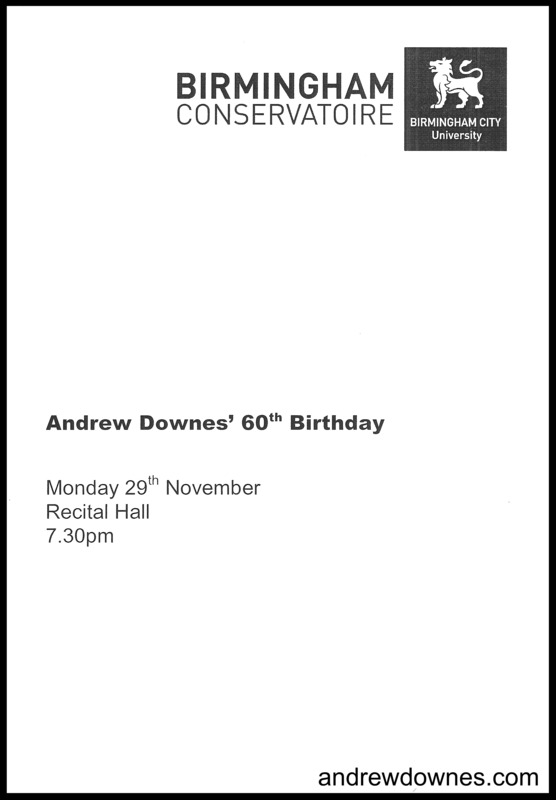 The work was chosen again for Andrew's 60th Birthday concert at the Conservatoire: another fabulous performance was given by Christopher Redgate and Malcolm Wilson. 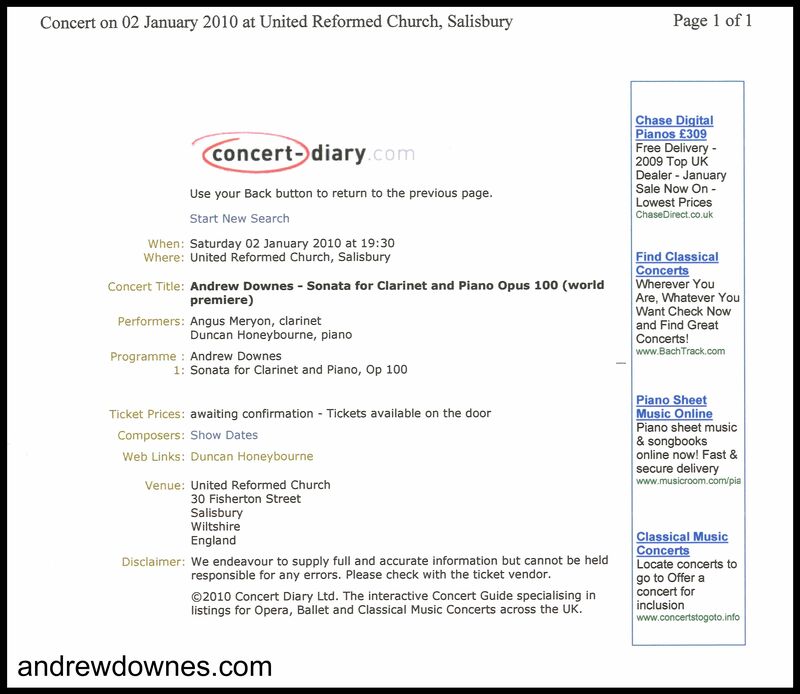 Andrew's Sonata for Clarinet and Piano is his Opus 100. 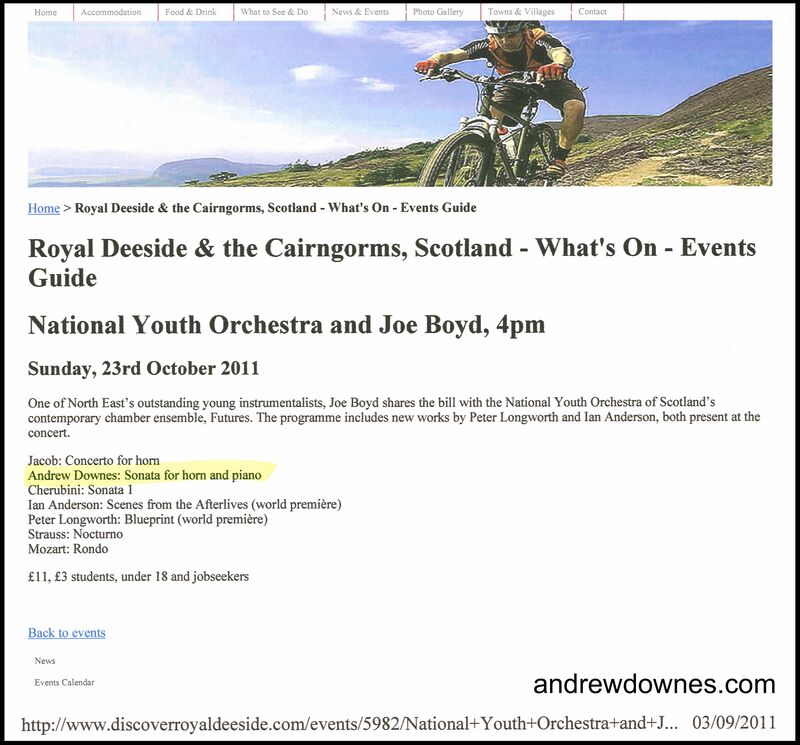 It was completed in the Autumn of 2009, just before Andrew fell and broke his back. 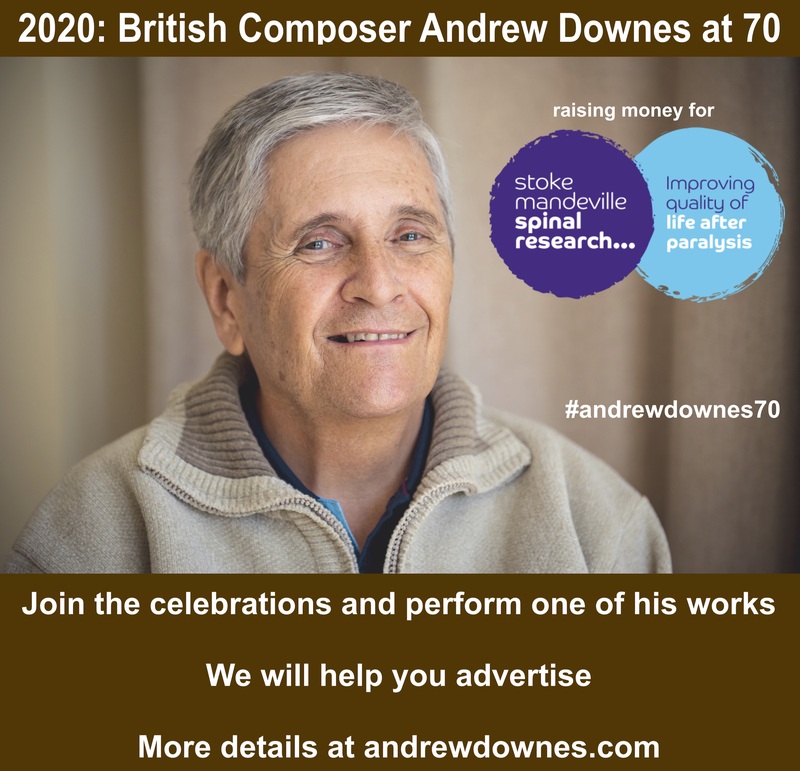 Andrew's brittle spine was brought about by his arthritic disease, ankylosing spondilitis. Russell's Hall hospital failed to diagnose the fracture until it was too late and did not immobilize him, with the result that he became paralysed from the waist down on that fateful day of October 8th 2009. 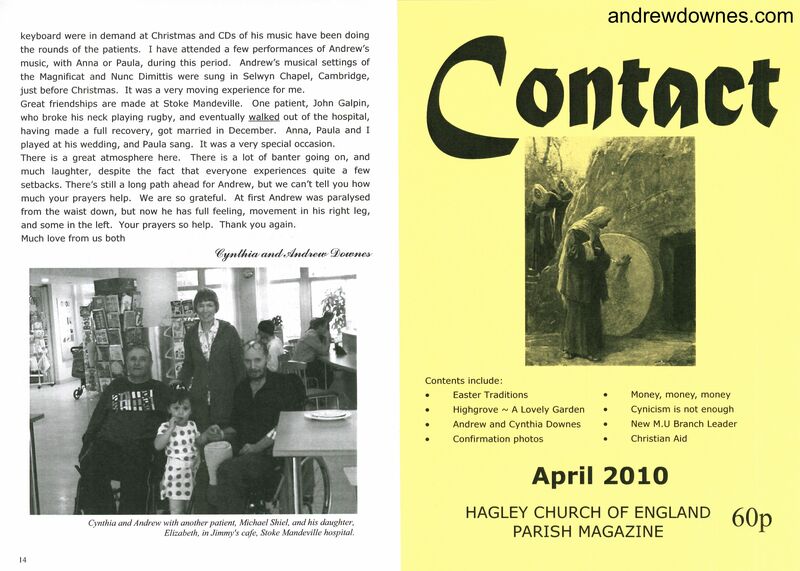 Cynthia Downes' article in Hagley Village Contact Magazine following Andrew's accident. 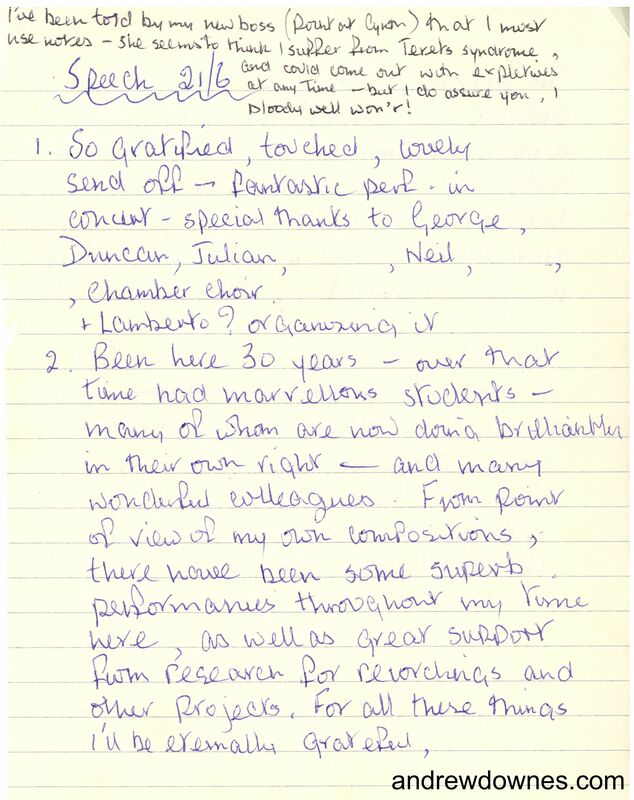 Andrew dedicated his Clarinet Sonata to Angus Meryon, a brilliant young clarinettist whom he had heard play at a chamber concert organised by Duncan Honeybourne. 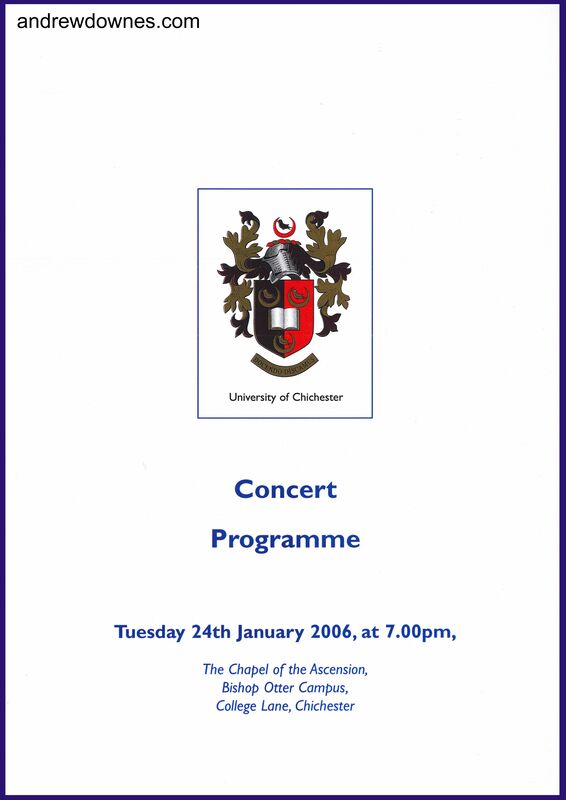 Angus Meryon and Duncan Honeybourne gave the world premiere on January 2nd 2010 in the United Reformed Church, Salisbury, as part of the Salisbury Chamber Music series. Andrew was recovering in the spinal injuries unit at Stoke Mandeville Hospital at this time, so our daughter, Anna, came with me to the premiere. I took the train from Aylesbury (nearest station to the hospital) and met Anna in London, where we took another train to Salisbury. 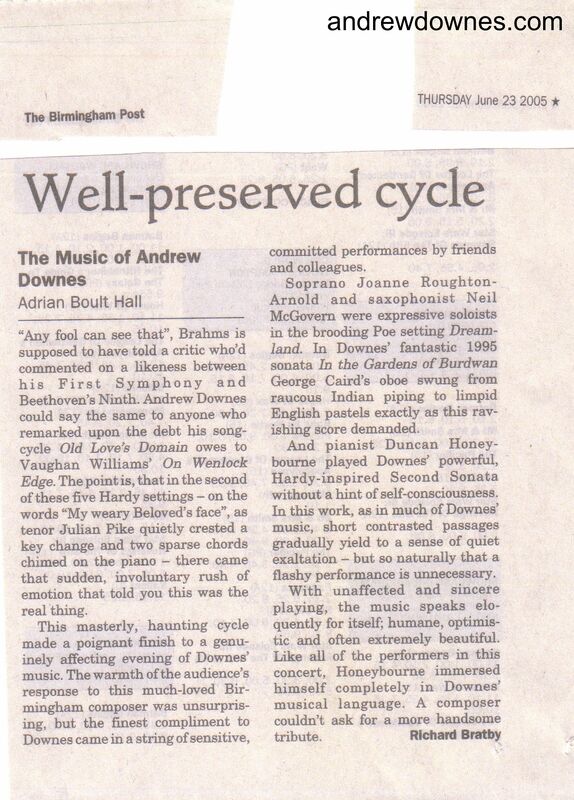 We loved the fantastic performance of Andrew's Clarinet Sonata by Angus and Duncan. I was very emotional during it, knowing that Andrew couldn't be at this special premiere. 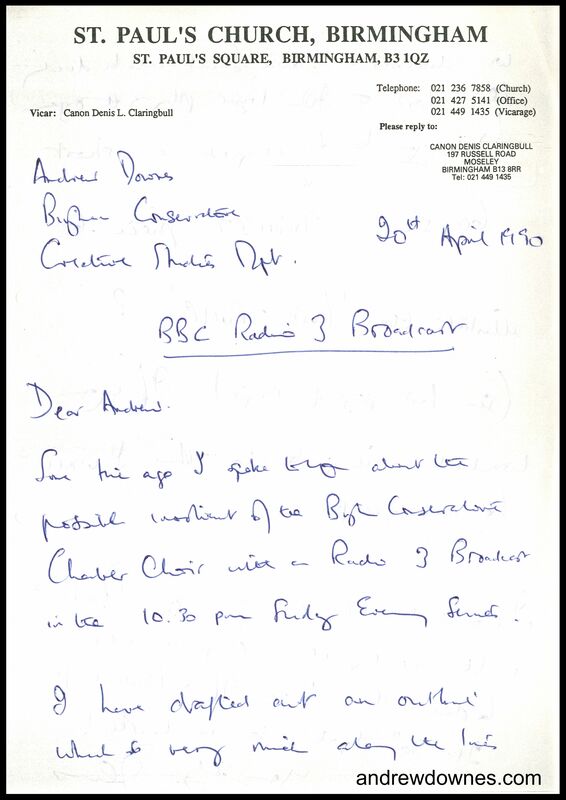 We recorded it, however, and Andrew listened to it next day in his hospital bed. 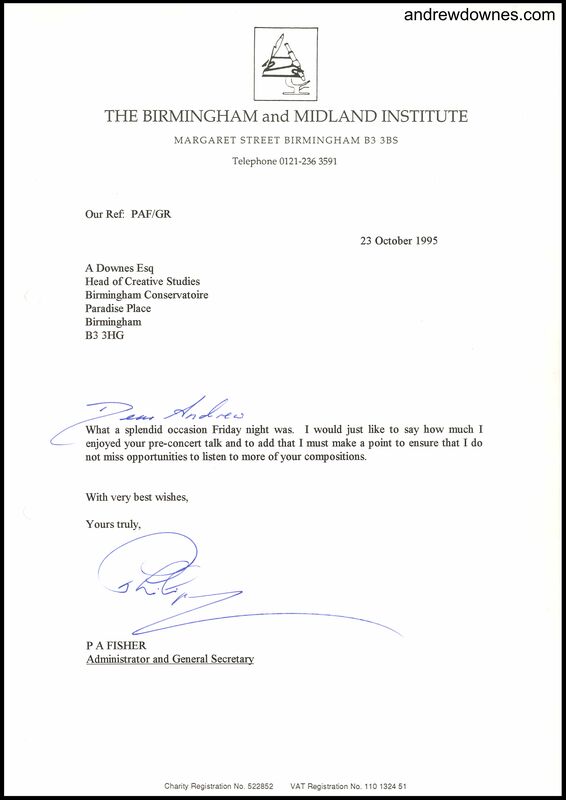 He was delighted! After the premiere of the Clarinet Sonata, Duncan, Anna and I went out for a drink together. 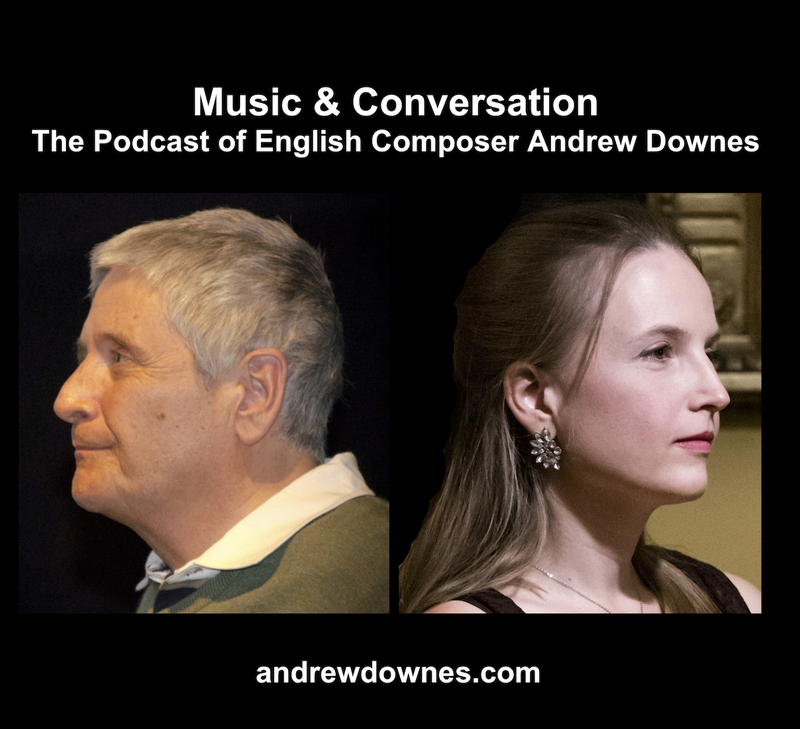 Anna and Duncan had the opportunity to discuss a second performance of Andrew's new Piano Concerto for Duncan with Anna's orchestra, the Central England Ensemble, to take place in June of that year in Coventry Cathedral. Then Anna and I stayed in a B&B before catching a train back next morning. I treated Anna to a lunch in a posh restaurant at the newly recreated St Pancras station, to thank her for coming with me. 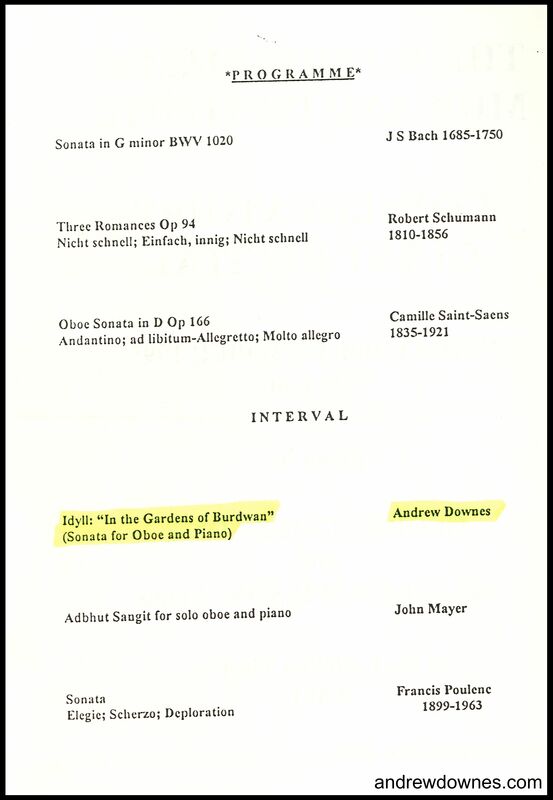 Going back in time, Andrew's Sonata for Horn and Piano was commissioned by Roland Horvath, Horn player from the Vienna Philharmonic Orchestra. 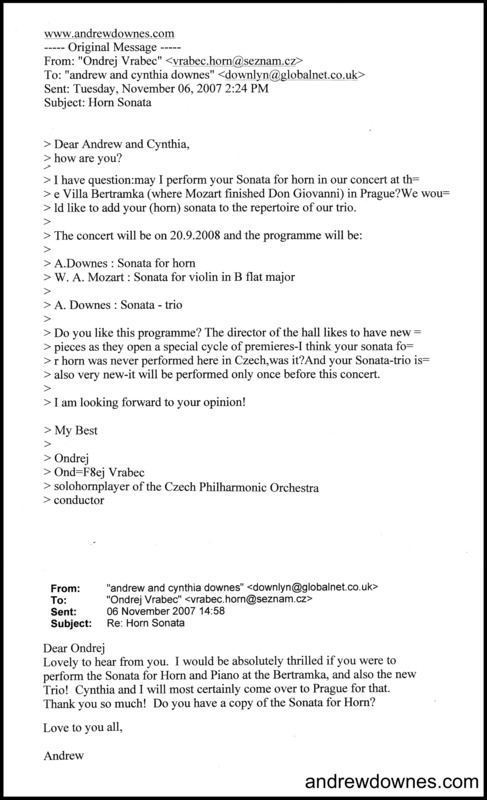 Roland founded the Vienna Horn Society, of which James Lowe is a member. 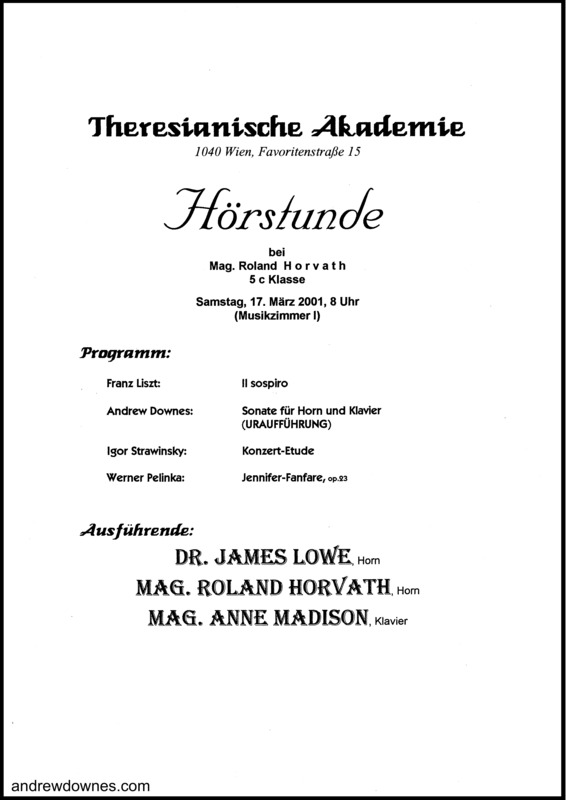 James Lowe, with American pianist, Ann Madison, gave the first performance of the work in the Theresianische Akademie in Vienna on 17th March 2001 and a second performance in a Salon Concert at the home of Roland Horvath in June 2001. 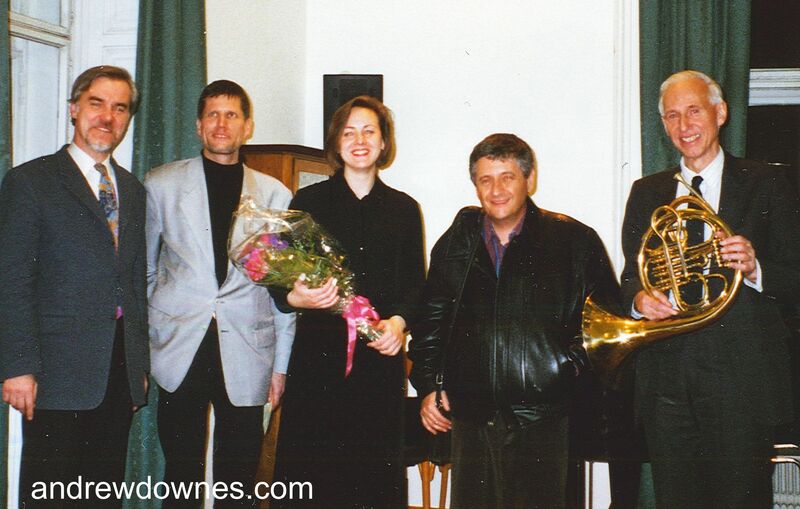 The Vienna Horn Society then went on to make 2 CDs of horn and piano music, Messen und Sonaten and Schlosskonzert. 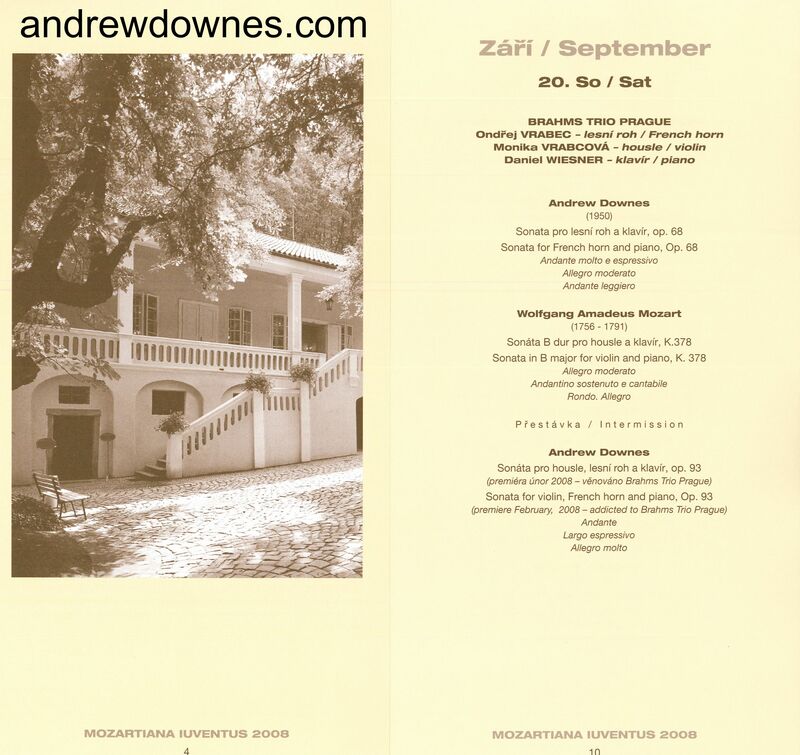 Andrew's music featured on each: his Sonata for 4 Horns, Suite for 6 Horns, his Piano Sonata No.1, played by Ann Madison, and his Sonata for Horn and Piano, played by James Lowe and Ann Madison. 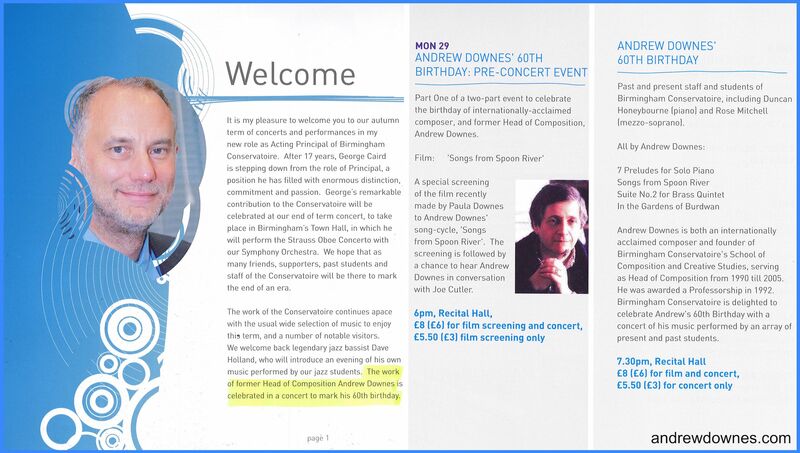 We couldn't get to these events, but were delighted with the CDs, and we managed to get to a performance of the Horn Sonata given by James Lowe and Ann Madison in the Austrian Gesellschaft fuer Musik in Vienna in December 2001. Being a German speaker, I was thrilled to go on this trip, during which Andrew gave a talk to students in a high school. 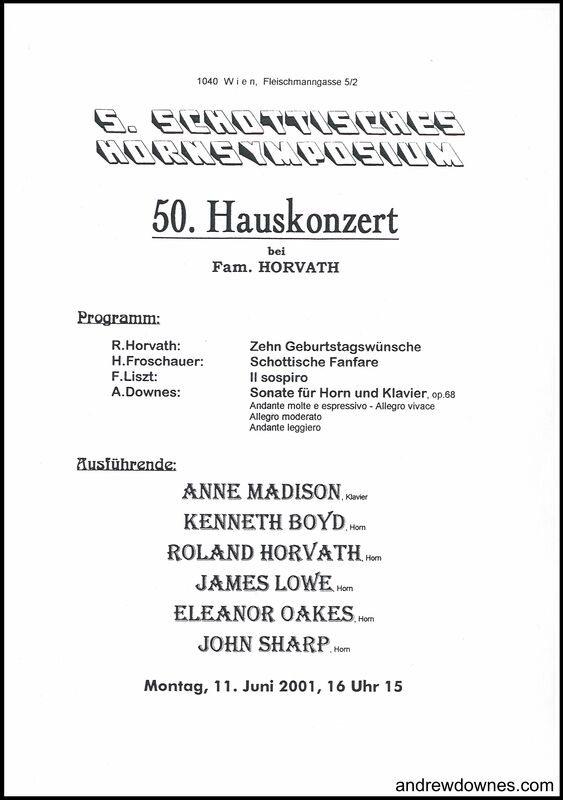 James Lowe and Ann Madison played the final movement of the Horn Sonata in a concert in Trinity Episcopal Cathedral, Nebraska, USA, in August 2002, the UK premiere of the whole work at Birmingham Conservatoire on 22nd September 2003 and another performance of movement 3 in the Vienna 'Haus der Komponisten' in December 2004. 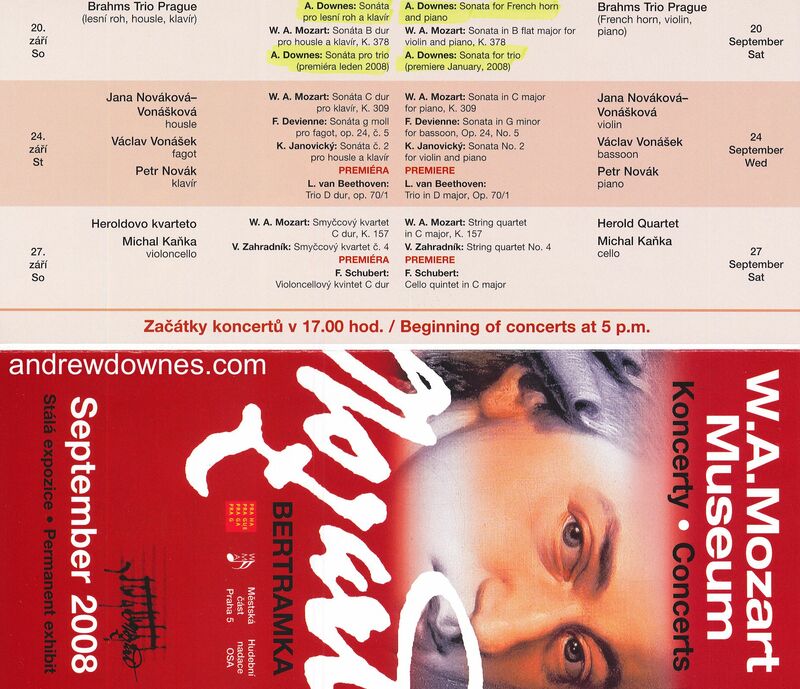 On September 20th 2008 Ondrej Vrabec, Principal Horn player of the Czech Philharmonic Orchestra, with his accompanist, Daniel Wiesner, gave the Czech premiere in the Villa Bertramka Mozart Museum in Prague. Andrew's sister, Judith, and her friend, came with us to hear this wonderful concert and also discover the delights of Prague. 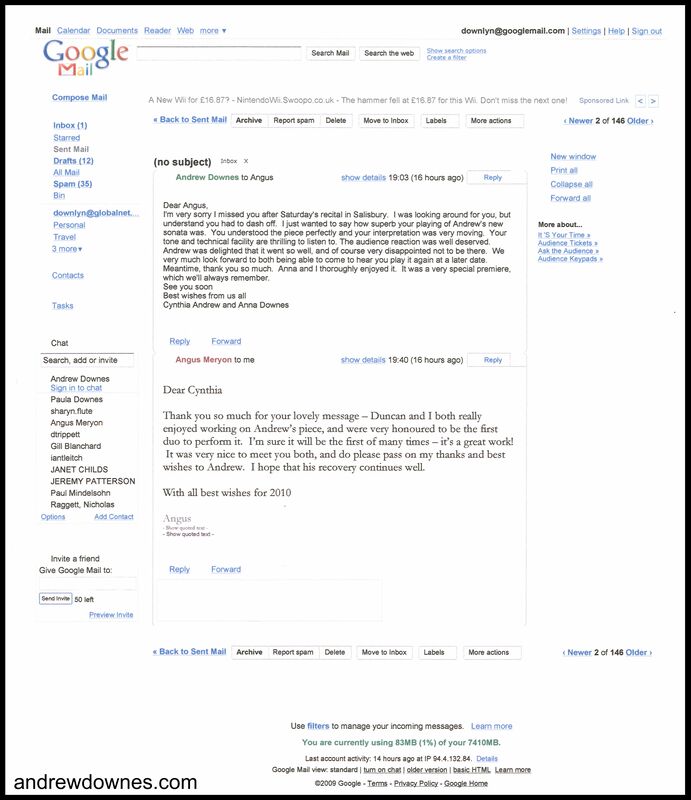 The whole experience was very helpful to Judith's friend, who had recently lost her husband. Ondrej's student played the work in her final recital at Prague Conservatory this year (2018)! 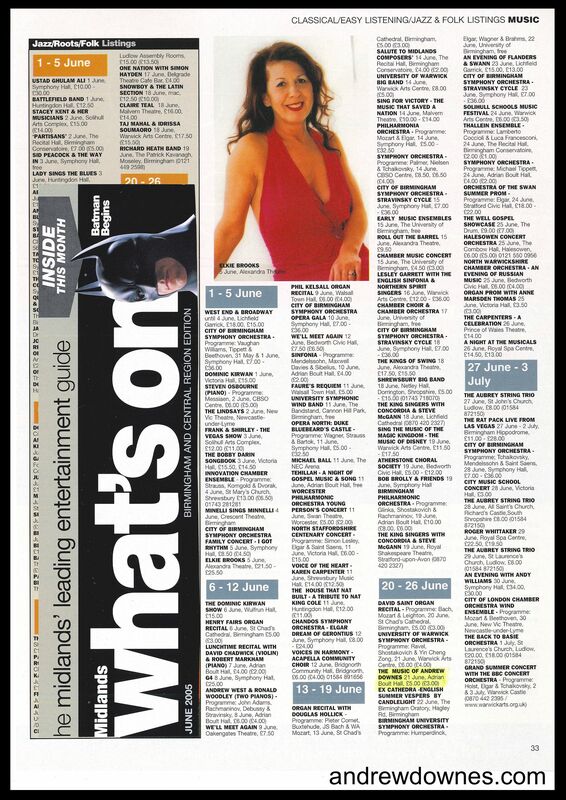 In 2011 two performances of the Horn Sonata were taking place on opposite sides of the world on the same weekend! 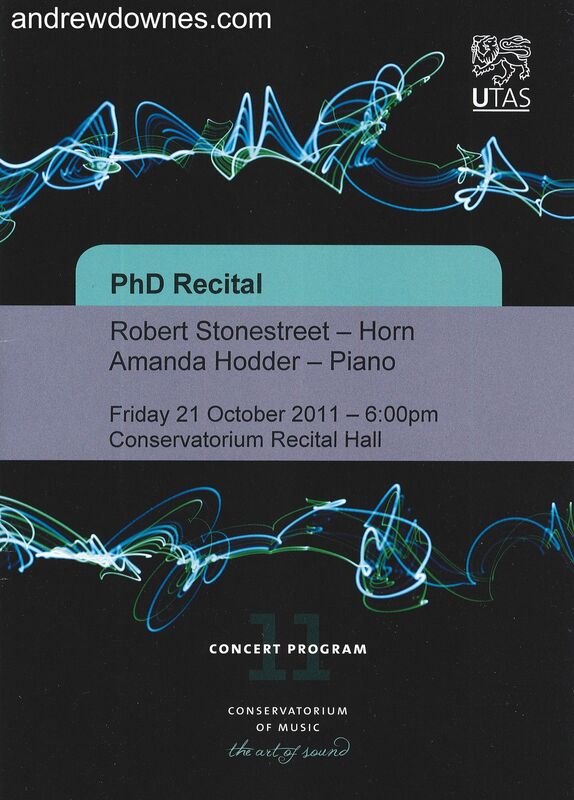 Robert Stonestreet and Amanda Hodder gave the first Australian performance of the Sonata at the University of Tasmania on 21st November and then on 23rd November the Scottish premiere was given by Joe Boyd at the North East Scotland Festival of Music, in a concert given by the National Youth Orchestra of Scotland Futures. 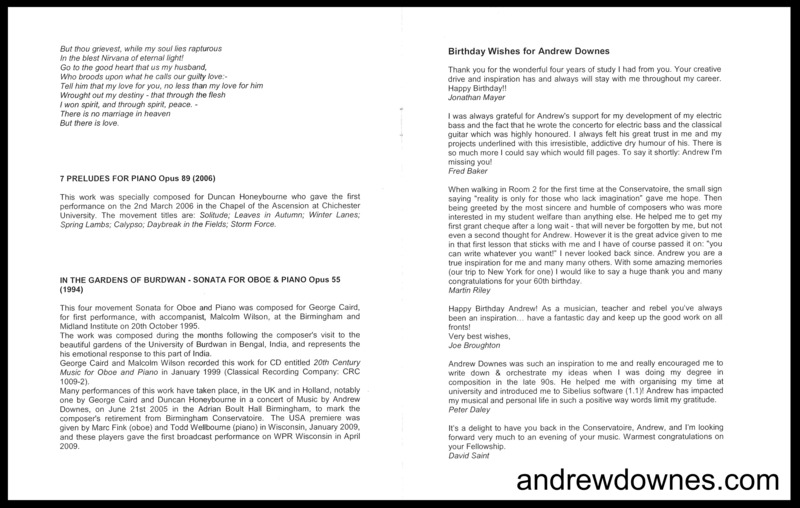 Andrew has composed two works for solo trumpet. 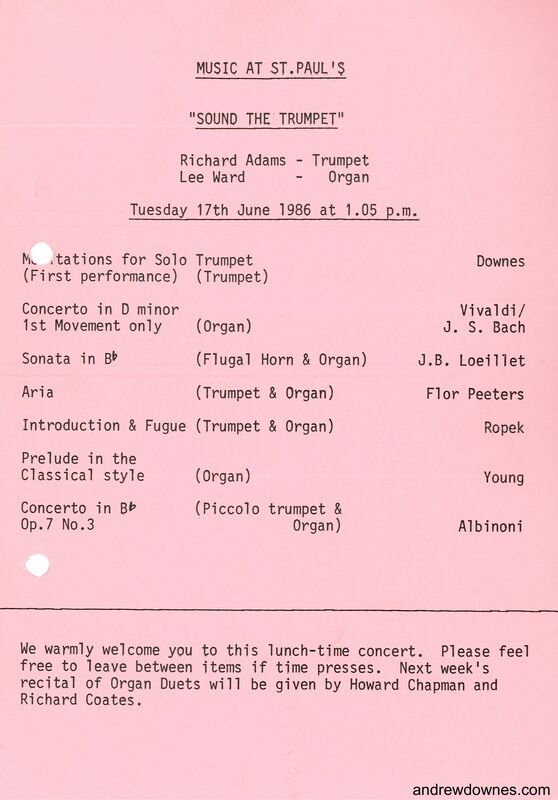 Firstly, Meditations for Solo Trumpet, commissioned by Richard Adams of the Cambrian Brass Ensemble and premiered by him in the wonderful acoustics of St Paul's, Hockley, Birmingham, on June 17th 1986. 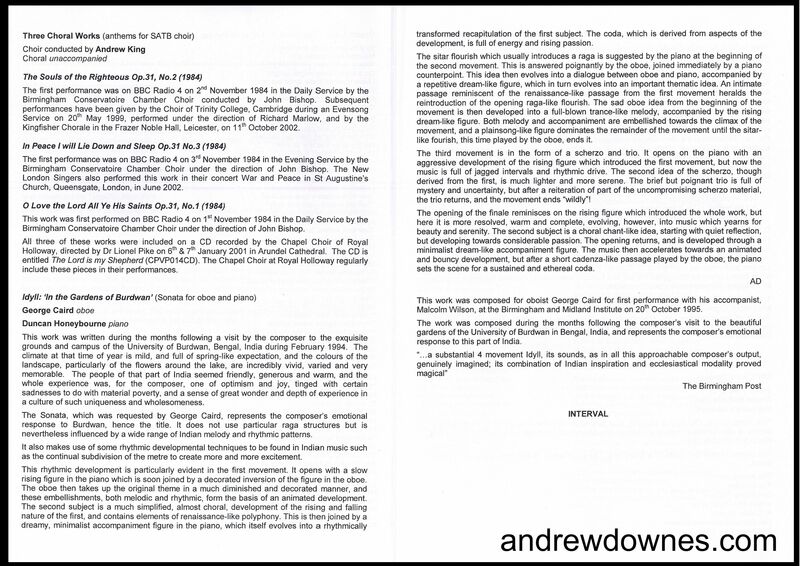 Andrew's second solo trumpet work, The Last Trumpet, was commissioned for the Radio 3 programme The Offering of Life by the Reverend Canon Denis Claringbull. 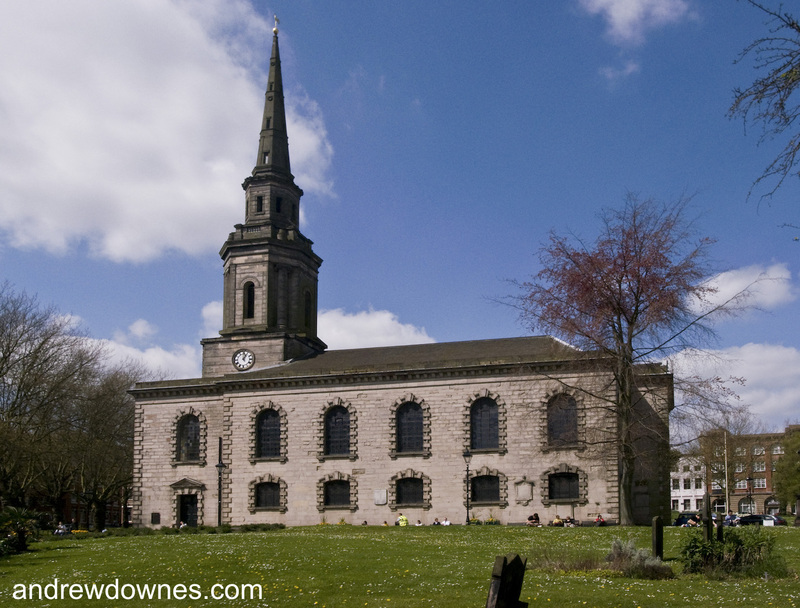 It was recorded by Garry Page of 'Brass Pages' in St Paul's Hockley and broadcast on 3rd February 1991. 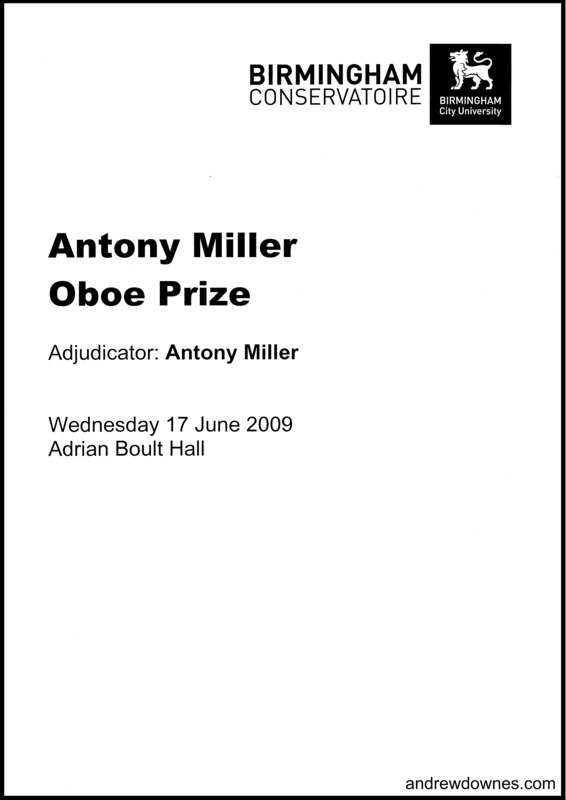 Both of these works have been performed at numerous student recitals over the years. 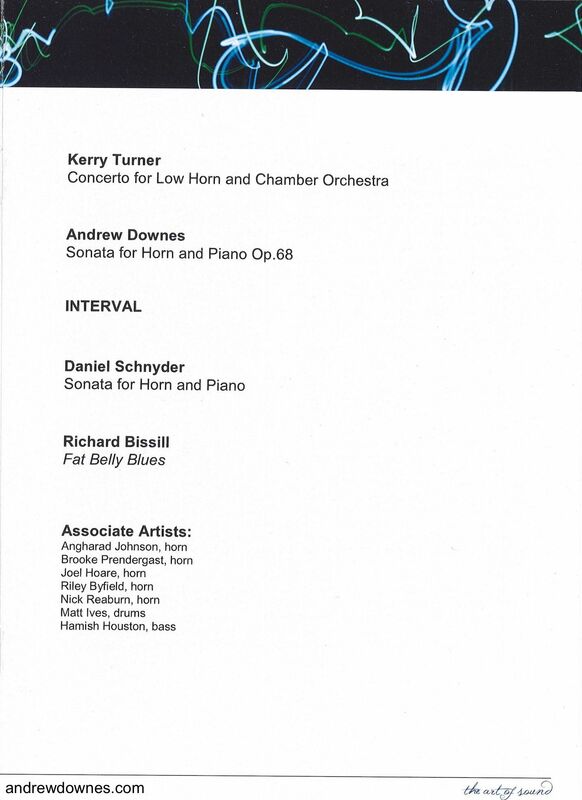 Jennifer Boase included the Meditations as part of her CD of works for solo trumpet, entitled Innovations. 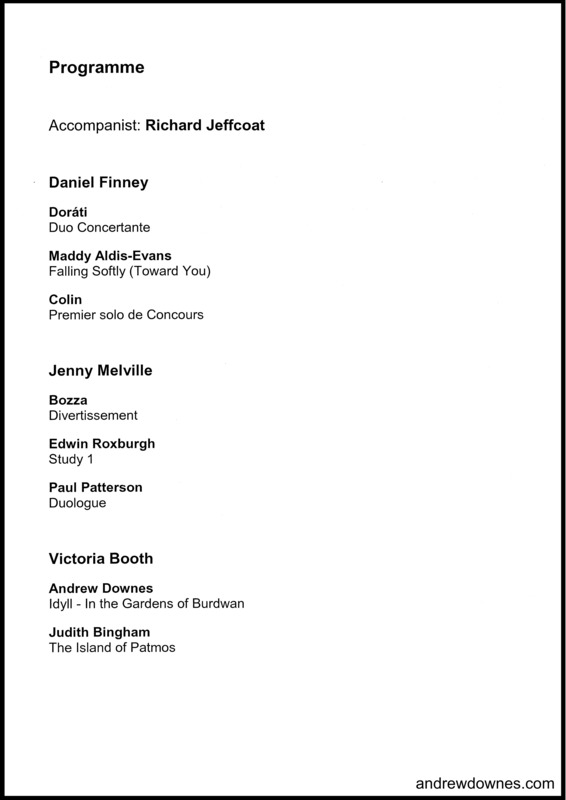 In November 2014 Ruari Wilson performed The Last Trumpet in Broughton St Mary's Parish Church, Edinburgh, as part of a special Service of Remembrance for the Centenary of World War 1. 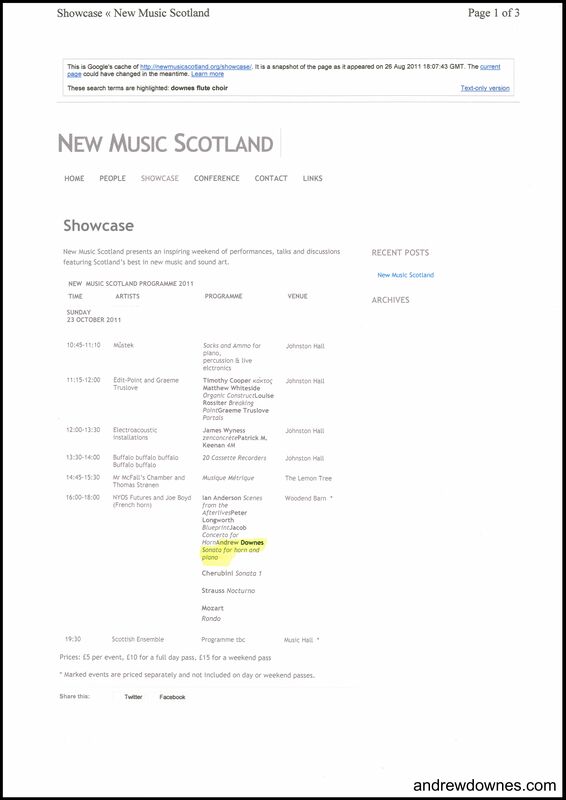 Finally, here is an extract from a performance of the Meditations for Solo Trumpet played by Louise Franks at the Royal Northern College of Music, recorded in February 2016.